Ben called in to DVE’s Morning Show to talk directly to Clairton Police Officer James Kuzak (below) who had also called in to the show to help kick off the WDVE Rocks Children’s Radiothon Fundraiser! “For me, you are a hero…I got to meet you at my event, and when I called last week it was to invite you to the game this week against the Jets. I wanted you to come sit in the box with my family and everything, and you said you would and that’s awesome…but there is another small little thing I was hoping I could ask you and see if you would want to do. But obviously, by no means do you have to do this. But like I said, you are a hero to us as a team and me, and to the people of Pittsburgh, and I was wondering if you would help kick off our season by starting the game off with the Terrible Towel twirl on the field? Did Officer Kuzak agree to kick off the Steelers season on the field this Sunday? Check out the audio from their on-air phone call to find out!! Ben also wanted to make a donation to the Fundraiser as well, AND he had an idea for a raffle item that you won’t want to pass up!! So click on the link above and listen to the Radiothon podcast! 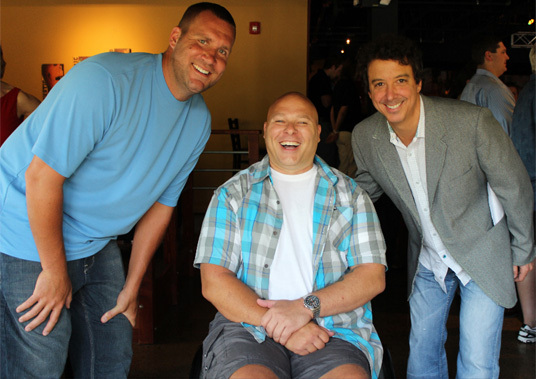 Ben and WDVE‘s Randy Baumann pose with Officer Kuzak at Ben’s Fundraiser in July at Jergels Rhythm Grille. On April 4th 2011, Patrolman James Kuzak and fellow officers of the Clairton Police Department answered a home invasion call in the City of Clairton. Upon arrival, Officer Kuzak was shot five times and critically wounded by two suspects as they fled the scene. Sustaining gunshot wounds to the chest, arm and side which severely injured his lung and spine, Officer Kuzak is recovering from his injuries as he begins a journey down a very long road to rehabilitation and recovery. You can read more about Officer Kuzak’s road to recovery here. *Thank you to Teresa Varley and Steelers.com for the photo!